This sparkly turkey is a bright and fun project for the 2nd grade class. It’s a good opportunity for them to practice cutting—we stress that they cut directly on the outside of the black lines. And of course using white glue and glitter is also fun. Different color combinations of paper and glitter make these an interesting display in the classroom or hall. 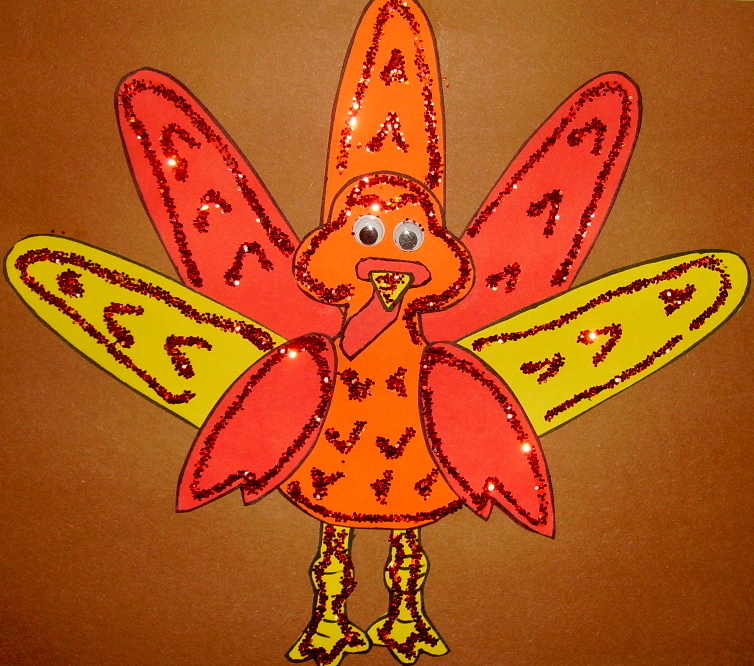 Patterns and directions for this project, “Glitter Turkey,” are in the 2nd Grade Projects Gallery in the sidebar. This entry was posted in 2nd Grade, Thanksgiving and tagged 2nd Grade, arts and crafts for kids, classroom thanksgiving craft, glitter turkey, sparkly turkey, thanksgiving crafts for kids, thanksgiving turkey craft for kids. Bookmark the permalink.